In June 2018, Drino Drinks Ltd. – the largest independent wholesale supplier of bottled drinks to the retail and licensed trades in the midlands and west – bolstered their superb fleet with the addition of two striking new Scania P230 curtainsiders. Irish Trucker visited the company’s Carrick-on-Shannon base and met with General Manager Sean McAuliffe to find out more. 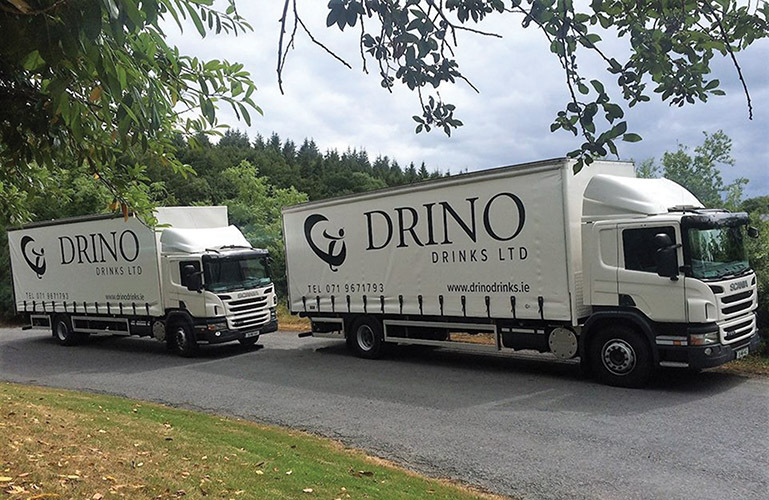 In business for more than half a century, Drino Drinks is one of Ireland’s oldest wholesale suppliers to the licensed and retail trade. The industry-leading Carrick-on-Shannon, County Leitrim headquartered operation continues to go from strength to strength, having this summer merged with Mullingar based Tara Wholesale Bottlers to become the largest independent wholesaler in the west and midlands, servicing customers in counties Sligo, Leitrim, Cavan, Roscommon, Longford, Westmeath, Meath, Kildare, Offaly, Dublin and indeed nationwide. As part of their ongoing fleet replenishment programme, Drino Drinks had previously added a new Volkswagen Crafter earlier in the past year. The services of Cawley’s, Sligo, Nolan Motors, Longford and CD Carrick Commercials, Carrick-on-Shannon are availed of to ensure that all vehicles are maintained in tip-top condition around the clock. Drino Drinks’ island-wide customers come from a broad section of the market, including wholesalers, hotels, bars, night clubs, sports clubs, convenience stores, independent retailers, forecourts, newsagents, fast food restaurants and takeaways, coffee shops, cafes, etc. The genesis of the business goes back to 1957 when founder / proprietor Pat McGovern, who was still in his teens at the time, together with his brother Mark commenced making squashes, cordials and glucose drinks at his home (Rantogue Stores) outside Drumshanbo in County Leitrim. This venture proved extremely successful, with drinks produced and sold under the registered brand name Drino. In 1972, the factory was extended and a fully-automated production line installed. As plastic bottles began to replace glass ones in the market in the early ‘80s, it was recognised that the cost of reinvesting to move with the market was prohibitively expensive and Pat opted to wind down production, instead shifting the focus of the business to supplying the bar trade with long neck bottles and designer drinks – a range which was expanded gradually over the years. As this business grew, in order to cater for the increased volume of trade, Drino Drinks relocated to a new state- of-the-art, purpose-built facility at Grange, Carrick-on-Shannon in 2005. Another landmark in the ongoing growth and development of the progressive, forward-thinking operation arrived this year with the addition of the Tara Wholesale Bottlers business, which leaves Drino Drinks in a decidedly strong position moving forward. At the time of writing, direct employment was generated for a team of 20. “We had a staff of 13 and that increased to 20 with the acquisition in May,” Sean notes. “Everything is run out of our depot in Carrick-on- Shannon.”. From here, a full range of bottled beers, spirits, kegs, wines, soft drinks, snacks, glassware and bar accessories is distributed to the licensed and retail trades. “Even before May, due to our strong team, we had been achieving incremental growth year on year, albeit in a very competitive market. We’ve been growing slowly and in a controlled manner, but the merging of the two family businesses allowed us to take that growth to the next level. “We’re in an excellent location here, just off the N4 in Carrick’, and we can conveniently service the north west, west, midlands and east, while we even have customers as far away as Cork and Limerick, whom we can get to pretty quickly due to the good roads network,” says Sean. Sean is confident that further growth is very much on the horizon: “That’s certainly the plan for the next couple of years, to keep growing within our means and without overstretching ourselves. 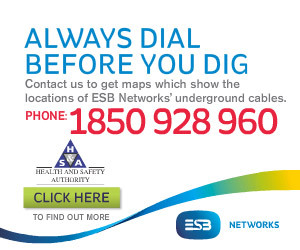 Our goal is to become the leading independent wholesaler in Ireland, not just in the west and midlands.